Craig was ready to go the distance when it came to his diet. Read on to see how he educated himself and lost 90 pounds along the way. I was on an overnight motorcycle trip in May 2009. While changing in the bathroom, I caught my reflection in a full length mirror. I did not recognize myself. I was also a heavily medicated diabetic as well as medicated for high blood pressure. In that moment, I threw away all of my meds (I do not recommend anyone do this) and said I was going to "fix" myself. When I returned home the next day, I had my first really healthy meal in many years. I'd love to say it was the diabetes and the blood pressure which caused this change, but it was 100% driven by how I looked. I am no longer taking any medication. Both the diabetes and HBP is controlled by diet. When I returned home the next day, I had my first really healthy meal in many years. Here is where things got bad for me, before they get better. 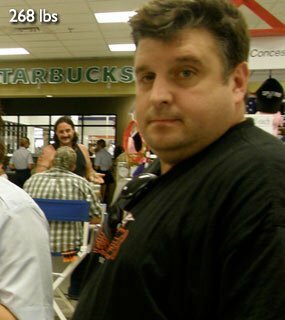 Before I found Bodybuilding.com, I knew of only one way to lose weight…starvation mode. I went on a 1000 calorie a day diet, and lost about 70lbs, along with any appreciable muscle I had. In December 2010, I found Bodybuilding.com, read tons and tons of posts/articles, and got my head on right. I lost an additional 20 pounds, but did so by way of a great diet, and a solid training program (all pro's Beginner program). Although I have lifted weights for many years, I always had a poor diet. Along with All_pro's training plan, and a good diet, I saw gains in months, which had eluded me for years. I was loving life. I have since added back about 15lbs, and feel it was added in most of the right places. I have never had my body fat tested, but I suspect is now about 17%. Some have said it is lower, but I am unsure. I know it was 30% when I began. I do have some loose skin, but everyday it gets a little better. I went from a size 44 pants to a size 32. I now wear size 34, but I attribute that to my legs, since my waist is now size 33 (as measured from my previous 44). I lost an additional 20 pounds, but did so by way of a great diet, and a solid training program. My diet is primarily a low carb diet (under 50g per day). This has been the most effective means of controlling my diabetes, as well as my overall weight. I do increase my carbs two days per week, not to exceed 150g on those two days. I train fasted everyday, which is open for debate for some. For me, it is a necessity (I train at 4 a.m.). My training is kept very simple; I used all pro's Beginner program (found in the workout section of the forums) for about 6 months. I have tried a few different routines since then, but have settled on a Push/Pull/Legs routine, with a "catch-up" day on Fridays. My training is a typical 5x5 routine, with some high rep work done for each body part after the heavy stuff has been lifted. My Friday training is a full upper body, with all movements being in the 12-15 rep range. I have a built in progression scheme, which incorporates increases every week. First and foremost, I do not know if my way is the best for anyone, including me. What I am doing right now feels great, and I am seeing nice progress. I am steadily working on my diet and training regimen, which I still struggle with. Having lost 90lbs has a way of making it hard to eat enough to start putting on weight. I still see the fat guy in the mirror. I trained for years and years with a horrible diet, and I never saw any real progress. I finally got my diet right, and things took off like crazy. I keep it simple because I feel like a beginner again. I have gotten so much help and support from the members of the Over 35 forum that there is no way I could ever repay them. The best I can do is pass on what has worked for me, and continue to push forward for the next rep. In short order, here is what works for me. If what you are doing is not working, do something different. It really is that simple. The basics of bodybuilding and training have not changed in my lifetime. People are consistently looking for the "next big thing," when it has been here all along. You are never too old to improve, and many of us find ourselves at our best, well over the age of 40. I'd like to thank all of my friends at the Over 35 section, as well as Bodybuilding.com in general. Without them, I'd still be wandering around looking for the next big thing.